Wondering how to take best advantage of the winter sun tomorrow? 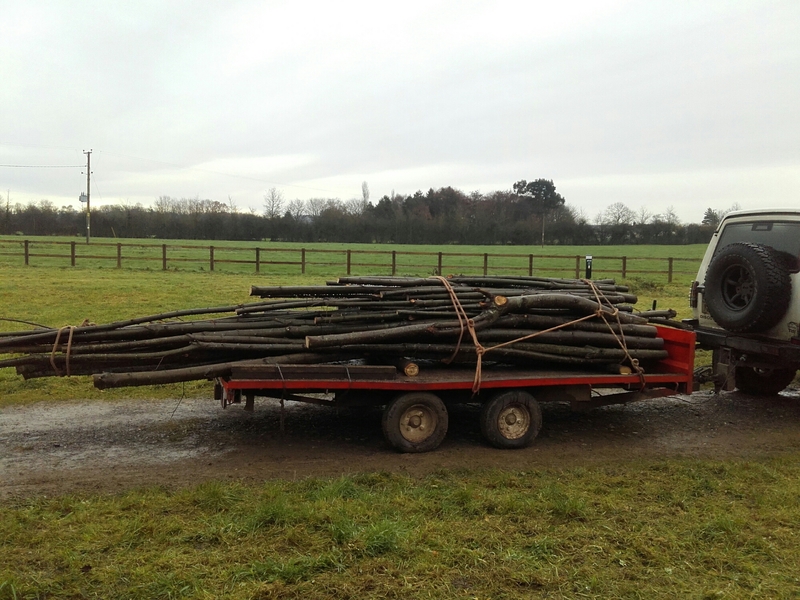 Well, we will be Sweet Chestnut coppicing in the beautiful Whatcome Woods… (Sunday 25th February). 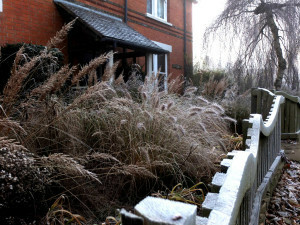 Please come along between from 10am until about 3pm and you can to see how we are harvesting this valuable resource. 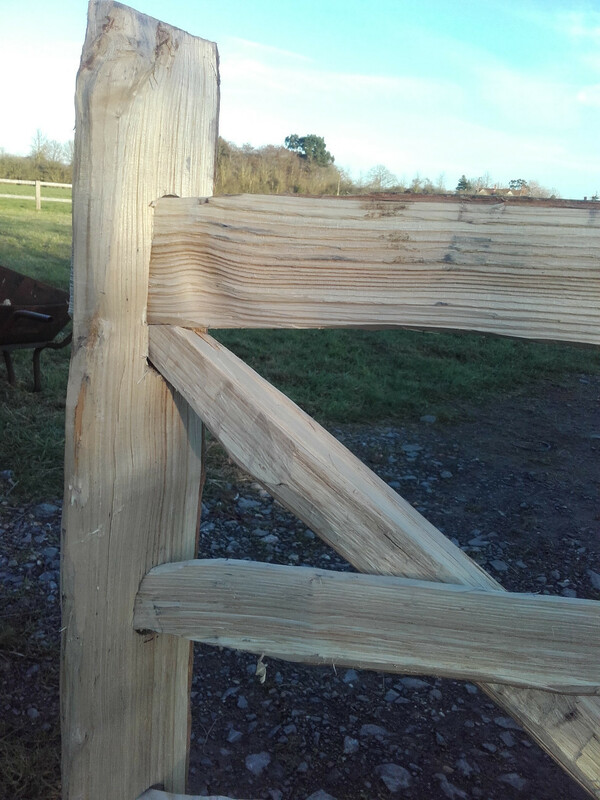 We may well also be clefting it to make posts, rails, palings and laths. 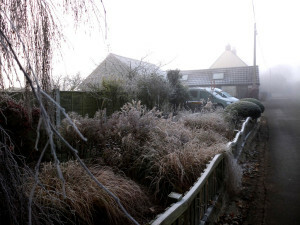 There should be a fire burning and a kettle on – bring a spud in tin foil and a mug! 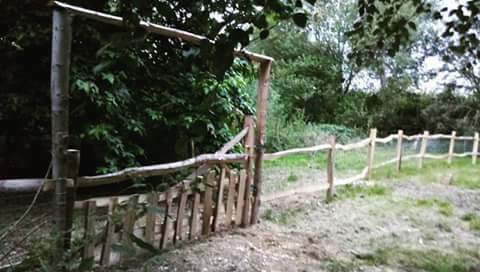 There will also be the chance to help in the building of a brash deer fence to protect the new growth of the chestnut stools over the coming couple of years. 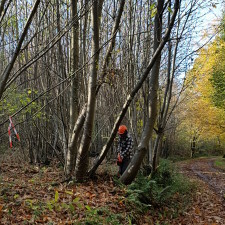 We will be Sweet Chestnut coppicing in Whatcome Woods this weekend, from Friday 26th until Monday 29th. 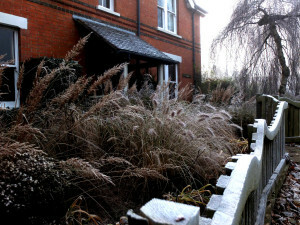 Please come along between from 10am until about 3pm if you can to see how we are harvesting this valuable resource. 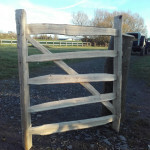 We may well also be clefting it to make posts, rails, palings and laths. 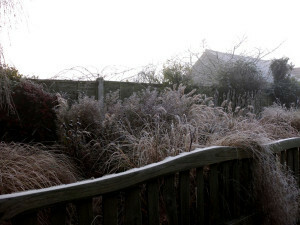 There should be a fire burning and a kettle on – bring a spud in tin foil and a mug! 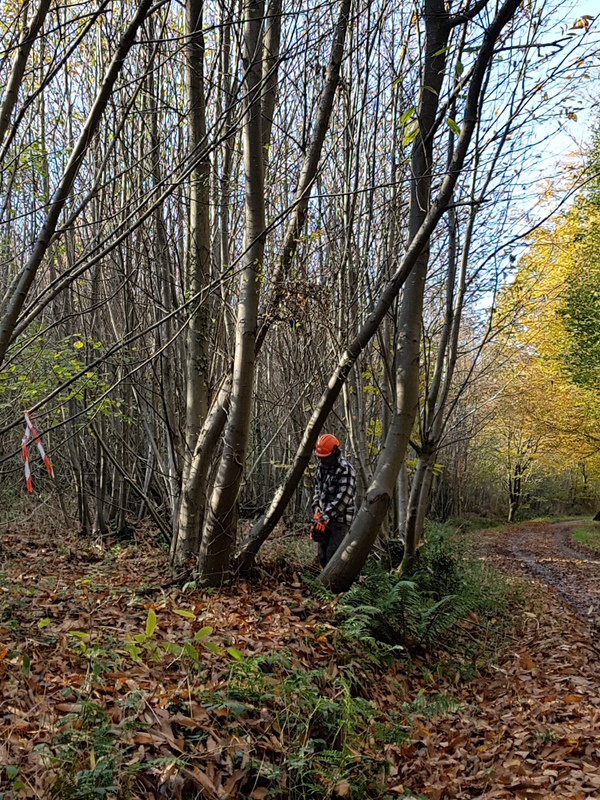 Our coup is Forestry Commission woodland so you’ll have to walk in – it’s about a mile with a couple of small(ish) hills along footpaths, bridleways and forestry tracks. 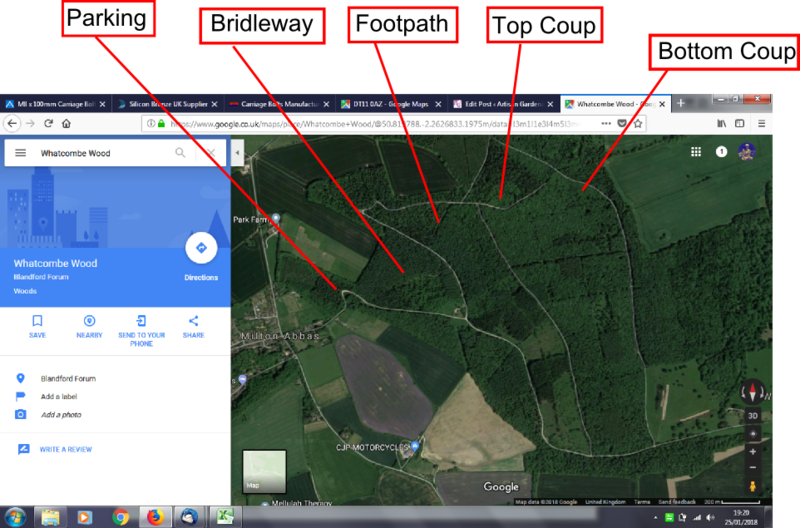 Head for DT11 0AZ (there will be a COPPICING sign to show you the turning) and carry on driving down the track until you reach a large dog-leg curve where there is space for parking. 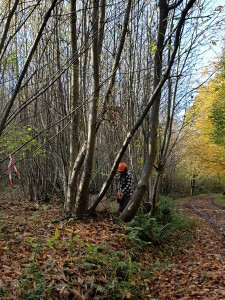 There is a bridleway further down the track on the left that will take you into the woods on foot – the route will be sign posted. 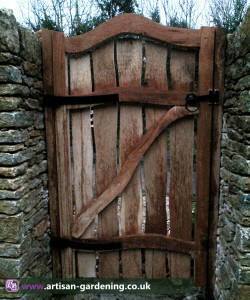 So we’ve made a cleft chestnut rustic garden gate for a fencing contractor. 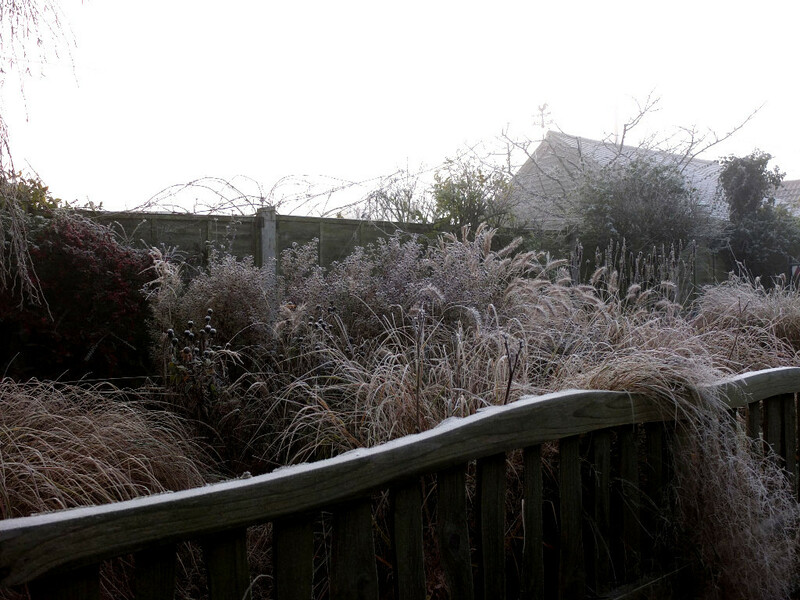 It’s been a while and is good to get back into the swing again. 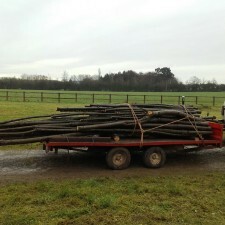 I started yesterday with a log of chestnut that we’d harvested from our coppice in the heart of Dorset. 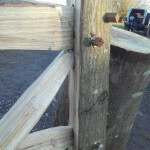 This I cleaved (split down the grain) for the stiles and rails. 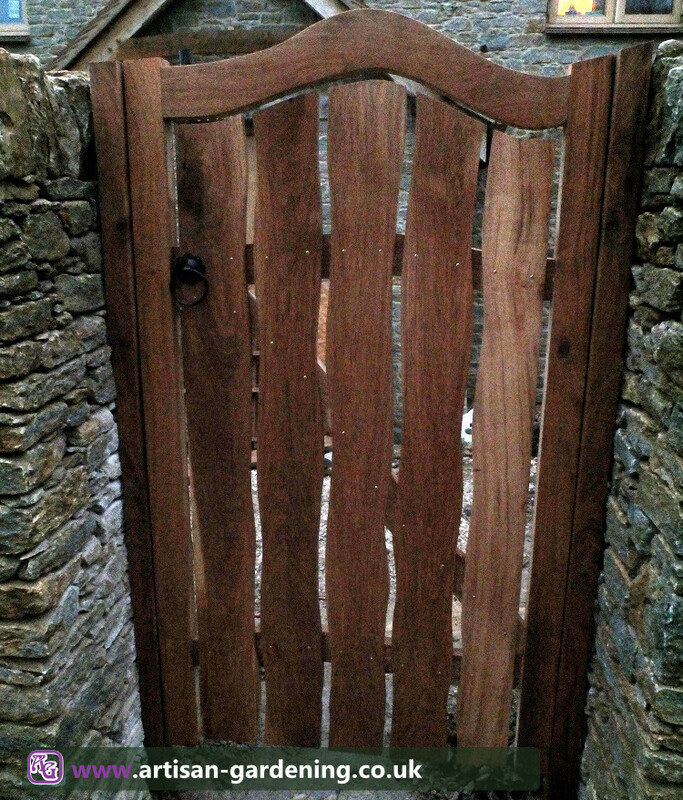 The rails are morticed into the stiles and fixed with cleft oak pegs. 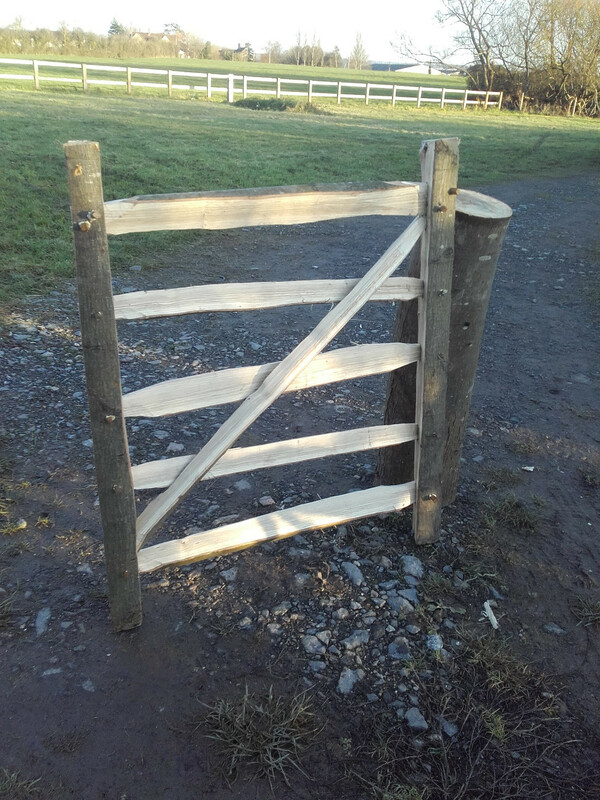 The diagonal brace was cleft from a bent log so it can bend round the rails and blind-morticed into the stiles for extra strength. 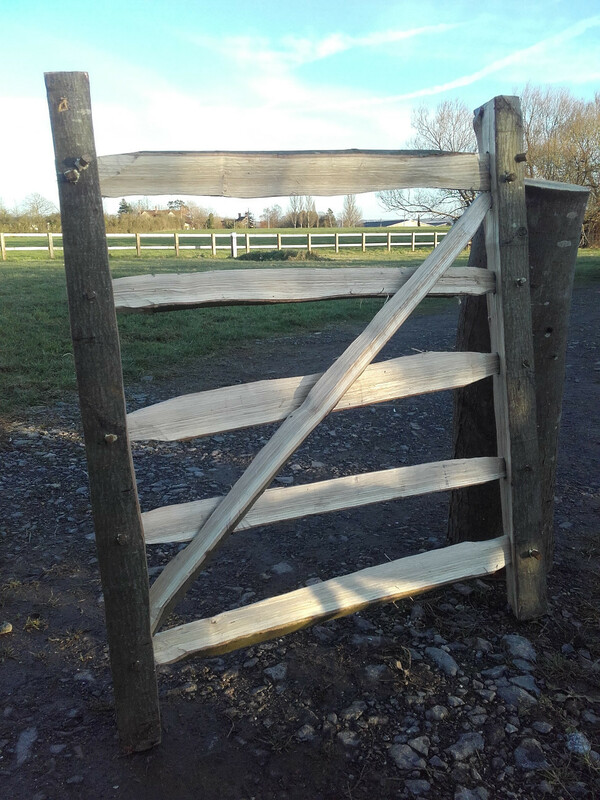 Sweet Chestnut is an incredibly resilient hardwood and this gate should last for many, many years with little or no maintenance. 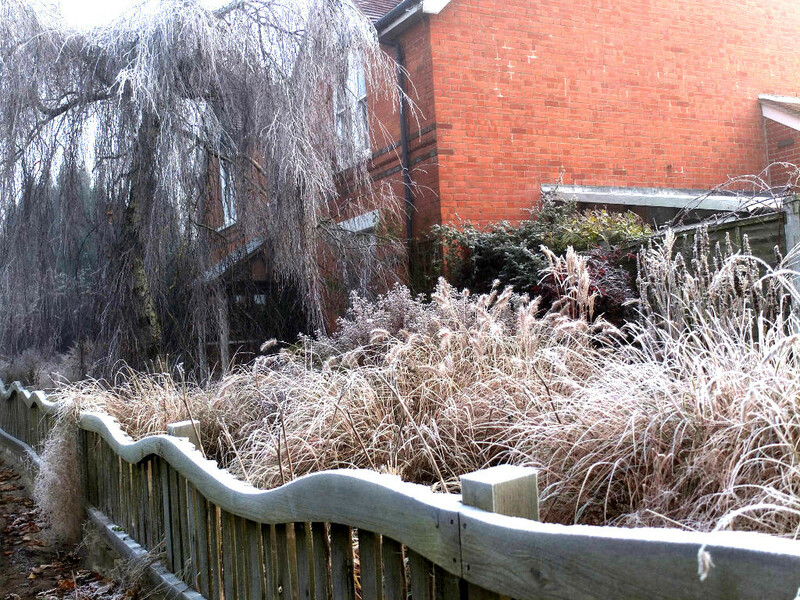 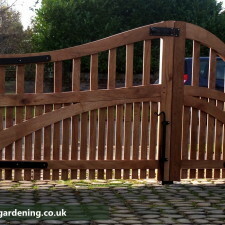 Artisan Gardening will make your garden gates to order to suit your requirements. The gates are made from Sweet Chesnut that is cleft to size using traditional tools and methods. 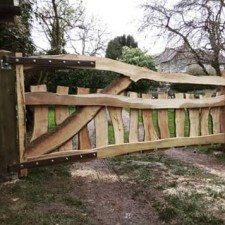 The gates are made using no metal fixings save the occasional brass screw. 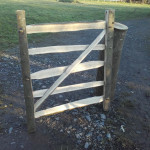 I’ve been meaning to make a new gate for our house for sometime. 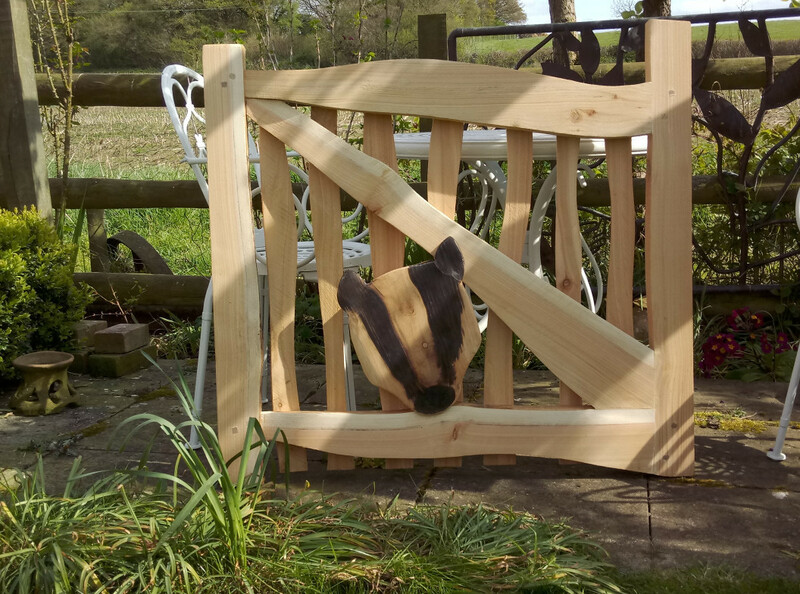 So it’s to match in with the wibbly cedar fence that I made a couple of years ago. 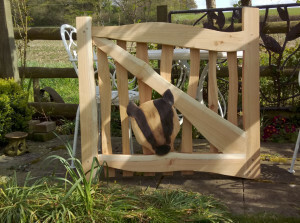 And seeing as our house is called Badger House, I thought that it should have a Badger in it. 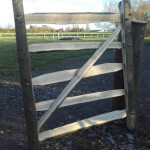 Just finished this evening, an English oak curvy entrance gate. 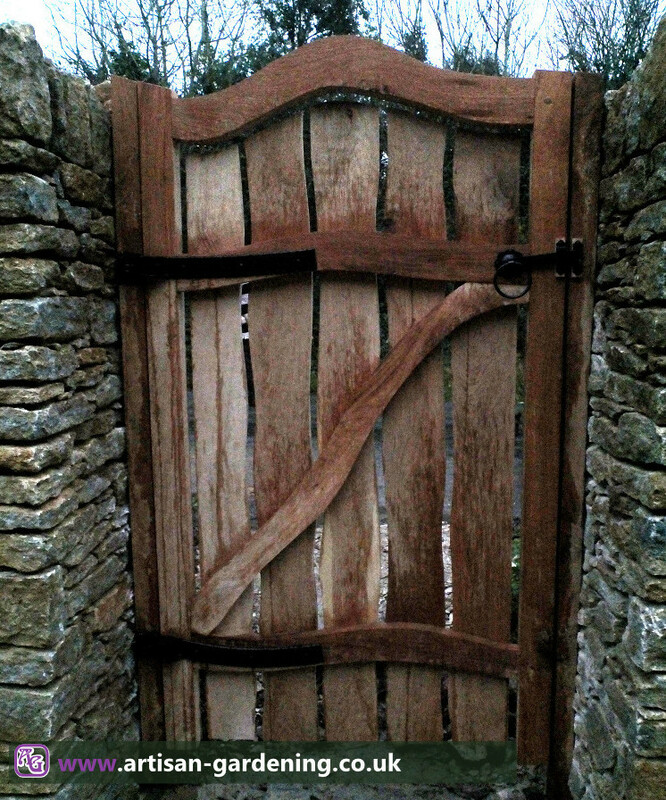 Made from locally sourced air dried English oak, made in our workshops and hung in the rain. 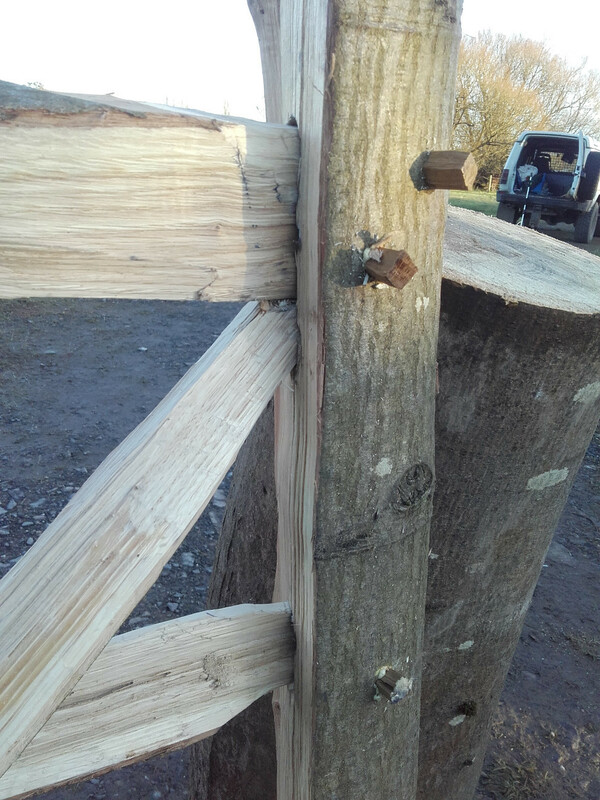 All structural joints are draw pegged mortice and tenon, brass screws and bespoke gate furniture made by the Dorset Forge. This border was designed and planted back last spring (2015) to provide year round interest. 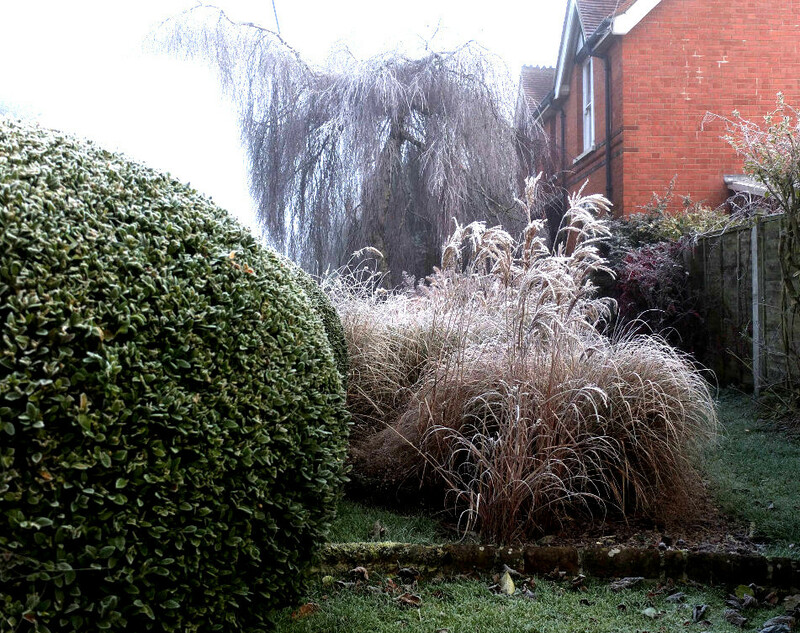 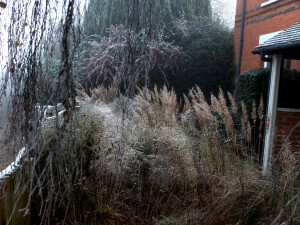 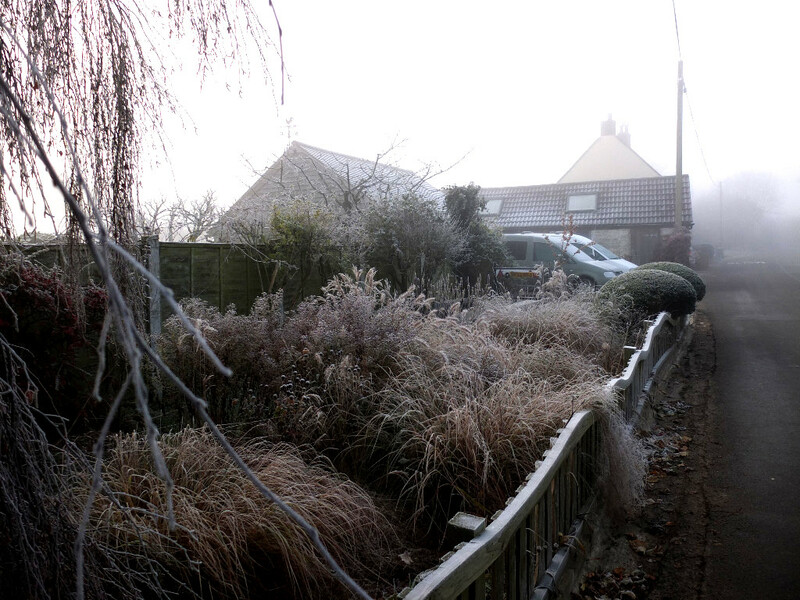 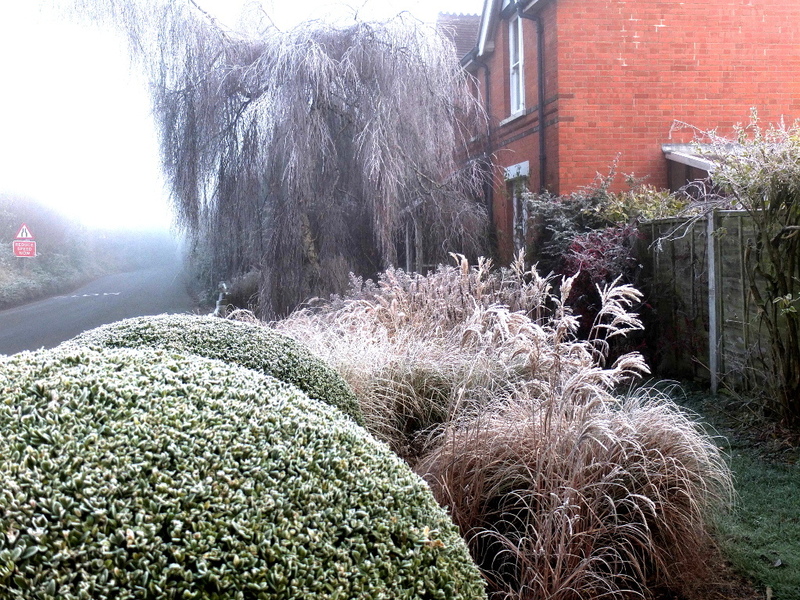 The summer and autumn colours for the past two years have been quite amazing and I knew that it would look pretty special with a hard hoar frost. 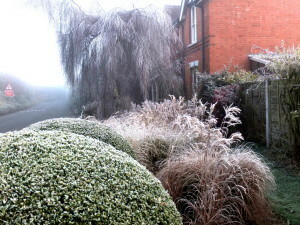 The week before last we had one..! 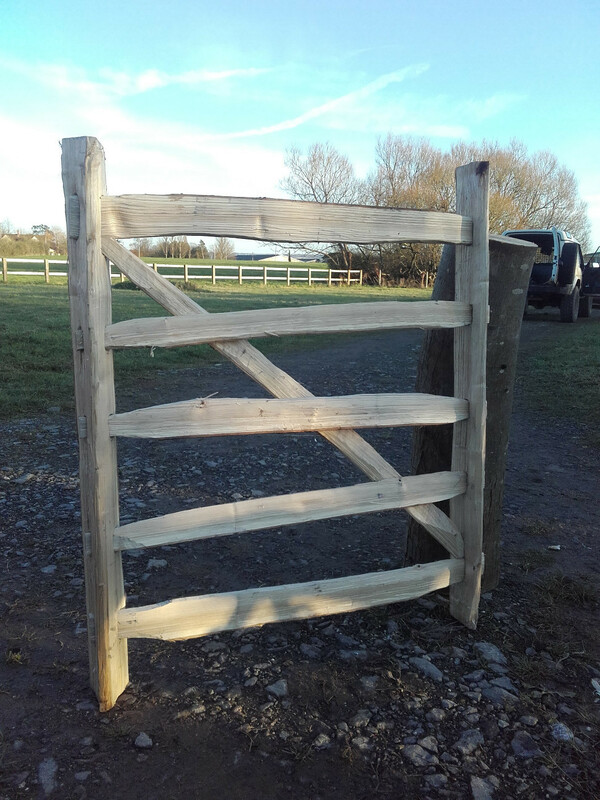 Here’s a recently completed pair of oak driveway gates made for a client that we met at the Stock Gaylard Oak Fair back in the summer. They feature curved rails and braces with asymmetric opening. 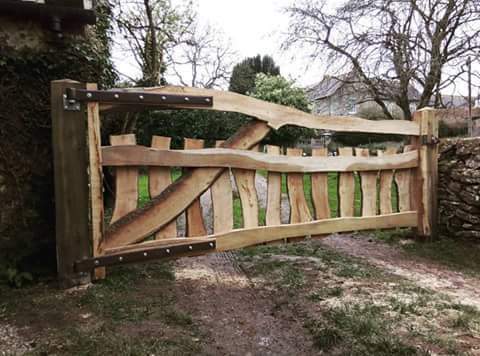 The gates are made from air dried oak to minimise movement as the timbers acclimatise and weather. 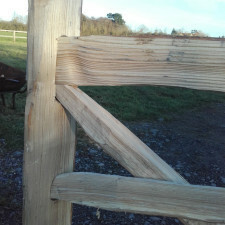 All structural joints are mortice and tennon with oak draw dowels. 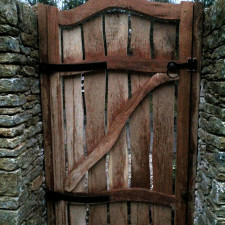 The hinges and latches were forged at the Dorset Forge specifically to fit the curve of the rails. 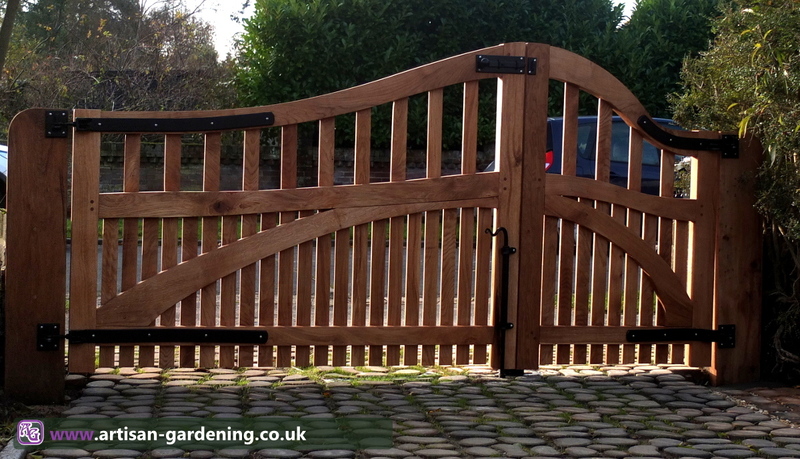 The gates have a sanded finish and have been treated to an undercoat and two top coats of OSMO UV Protection Oil.